The Canadian Opera Company's Week of GrimmFest! The brothers in question are Jacob and Wilhelm Grimm, two aspiring writers who are currently working below their pay grade as dictionary researchers. One day the brothers are solicited by a colleague Brentano to write a book full of folk tales and campfire stories. So the brothers start on an adventure to liberate stories from their friends and acquaintances! Through their travels they collect three key stories. Dortchen, a young maid besotted by Wilhelm, provides them with the seed for Rapunzel, shop-keeper Frau Viehmann introduces the moral tale of Little Red Cap and the narcoleptic Colonel Krause spins them the tale of Rumpelstiltskin. How can I see this production? The Brothers Grimm is currently touring across Ontario with Hansel and Gretel for the Xstrata Ensemble Studio School Tour and can be seen this December during GrimmFest, which runs from December 4 - 8. 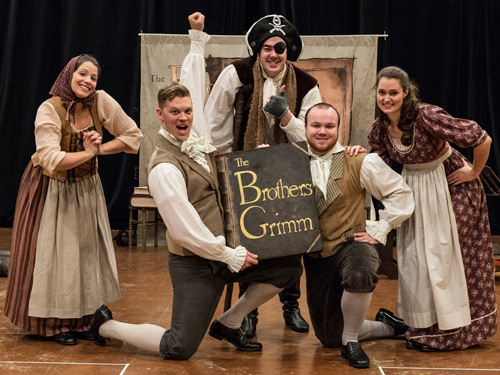 The Brothers Grimm will be performed on December 7 and 8 at Daniels Spectrum (formerly Regent Park Arts and Cultural Centre). Tickets are $25 for adults, $15 for children and can be purchased online or on the phone.